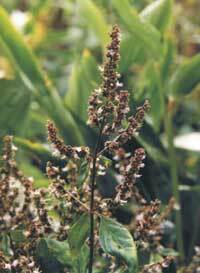 Of West Indies, Indian, and oriental origin, patchouli is a delightfully aromatic, perennial herb to 1 metre high. An evergreen bush, with new stems forming square, which mature into round, woody, brown branches. Ovate-eliptic shaped leaves 5-15cm long, have small soft toothed margins. Flower spikes of clusters of very tiny, pink lip flowers form on axillary and terminal stems. As the flowers fade, the fine, brown seeds form in small capsules, that look like tiny knots on the spike. Leaves, flowers and seeds freely give off their aroma, but even more so if crushed between the fingers. When the stems are cut, their aroma will permeate the room as they dry, which is quite delightful. Oil of patchouli has had a long history of medicinal use in India, China and Japan. Patchouli has a sweet spicy aroma, with a hint of musk, used to stimulate the nervous system, lift depressed moods, relieve stress and give a feeling of elation and wellbeing. Patchouli is believed to help balance the endocrine system, which in turn balances the hormones of the body. The aroma assists the body to relax and promotes a feeling of peace. It also stimulates the pituitary gland, which secretes endorphins, which are known for their ability to relieve pain and induce euphoria as well as sexual feelings. Just sniffing the fresh leaves can give a feeling of rejuvenation when feeling worn out. Perhaps, we need to appreciate the sense of smell and what it can do for us, by giving ourselves just a few seconds to enjoy the perfumes growing in our garden; a natural way to relieve stress or pain and simply enhance our joy of life. The essential oil is used as a room freshener, several drops added to the bath water, or put on a handkerchief. The pure essential oil is very strong and can be tempered down by adding 10-20 drops of oil to 2 tablesp. of almond oil and 5 drops of wheatgerm oil to preserve freshness. The oil is rubbed on pulse points, temples or the mixture used as a massage oil. It is also used to cool inflamed skin, and clear rough, cracked skin, sores, wounds and to treat minor skin disorders such as acne and dermatitis. Oil of patchouli is used in aromatherapy to clear lethargy and sharpen the wits. It is a practical oil for releasing stress and tension in males. If a man wants to attracts a woman, he could try patchouli perfume as a lure! Patchouli is cultivated extensively in India, Madagascar, Sumatra and the Seychelles for steam distillation of oil and used extensively in the manufacture of perfumes, incense, soaps, hair tonic, tobacco and cosmetics. Patchouli is known as one of the best fixatives in heavy perfumes. A fixative is a substance that helps the other ingredients hold their perfume longer. Its musty, earthy, scent is used as a base note in a third of all women’s perfumes produced and half of men’s perfumes.